True or False: Male and female athletes can compete in the same sport on a completely equal basis? If you answered ‘false,’ you’ll have to take time to drop by the Carter Community Building Association’s (CCBA) Witherell Recreation Center gym in downtown Lebanon and take in an action-packed game of floor hockey. Yes, floor hockey! Harken back to those days in grade school gym class when the instructor brought out two nets, placed them on opposite ends of the gymnasium floor, and handed you a hockey stick. Suddenly you were introduced to an indoor version of the rugged game of ice hockey without knowing how to skate. Perhaps that instruction turned you on to the popular game of field hockey. Maybe you had already taken to the street in front of your house and endured a fierce neighborhood game of street hockey. Ben Arellano works out as the goalie for the Red Team. 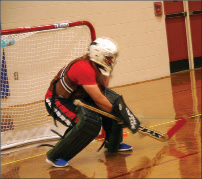 Floor hockey combines all of those elements into one single, action-packed sport designed to place men and women on an even playing field. 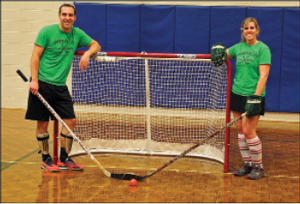 The Upper Valley Floor Hockey Association was introduced to the area by Grantham residents Jared and Becky Rhoads. Becky, a native of Rutland, Vt., grew up playing ice hockey with the boys and later became a standout player at the University of Vermont. Jared, a native of North Reading, Mass., played soccer, baseball, and was on the track team. This athletic couple were seeking something new they could participate in together. Kevin Talcott, sports director of the CCBA, felt the introduction of floor hockey would be a welcome addition. 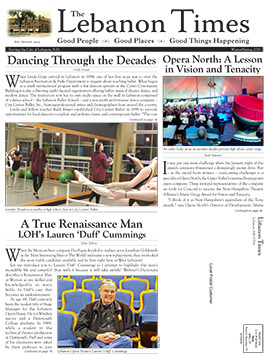 “We offer such a wide variety of activities here that it appeared that floor hockey would fit right in very nicely. Jared and Becky established a league and we reserved a basketball court on Wednesday nights for them, and it took off from there,” Talcott said. Shawn Quelch and Becky Rhoads square off to start the game. While Jared loves the pure competitive nature of the game, he also admires the aerobic benefit of playing floor hockey. To that end, the rules require each team to have at least nine or 10 players so frequent substitutions can be made. The key element of that rule is that there be a minimum of one woman on the court from each team at all times. That has changed the style of play considerably. Rough play is discouraged right from the start and every game features a referee, but penalties are very rare. Establishing game etiquette was a key element to the success of the program. Each player must wear eye protection, while shin guards and elbow pads are the order of the day. The majority of the players use modified or taped hockey sticks, and in place of a puck, a small, red plastic ball is used. The goalie for each team is padded from head to foot, with good reason. Most shots on goal are at point blank range. 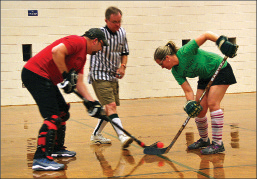 The floor hockey league is entering its second year, and the league plans to play a nine-week schedule in all four seasons. To learn how to get involved, visit uvfloorhockey.com.